The La Sal Mountains, from Hatch Point. After ogling the views of The Needles and the Lockhart Basin area from Needles Overlook, I drove north up across the mesa called Hatch Point. Canyonlands off to the west, the snowy La Sal Mountains to the east. Hatch Point is a sagebrush mesa where I’ve often seen pronghorn (“antelope”). I wasn’t disappointed this time, either. And in this location I was once again lucky enough to have the La Sal Mountains as a spectacular background. But they weren’t going to let me get anywhere close to them, even with a long lens. A herd of pronghorn on Hatch Point, with the La Sals in the distance. Pronghorn moving away from me, just in case. Notice the blaze orange on the one’s neck; must be a radio collar for wildlife management monitoring. At one point there is a sign pointing to the Wine Glass, a fantastical formation in one of the sandstone cliffs. Erosion is the process whereby the landscape weathers. Meaning it’s continually in a state of falling apart. It’s amazing how lovely things get by falling apart. The Wine Glass, Hatch Point. The Anticline Overlook trailhead, just a short walk from the parking area. Notice the Utah Juniper tree behind — loaded with cones! Utah Juniper “berries”, which are fleshy cones that look like blueberries. They don’t taste like them, that’s for sure. The Anticline Overlook looks down onto a paradox. One where the mighty Colorado River carved through the massive cliffs of the Moab Rim, instead of flowing around it. Of course there is a geological explanation for it! Or you can just forget about that and appreciate the sublime scenery. Especially on a late winter’s day with a storm front mixing sunshine, shadows, and advancing snow squalls from the north. From the Anticline Overlook, it’s impressive how the Colorado River cut through the cliffs instead of being channeled along them. I found my campsite for the night. It’s right on the rim of the Point, a priceless view, and free. None of your business as to exactly where it is! The rim of Hatch Point. I had a bite to eat while watching the snow squalls come at me and around me. Campsite deluxe! So what if it’s going to snow? Snow squall in Kane Springs Canyon. Then it was sunset time. The dark clouds with the sunset spilling through made for a dramatic view of the cliffs and canyons. Sunset from the Anticline Overlook area. 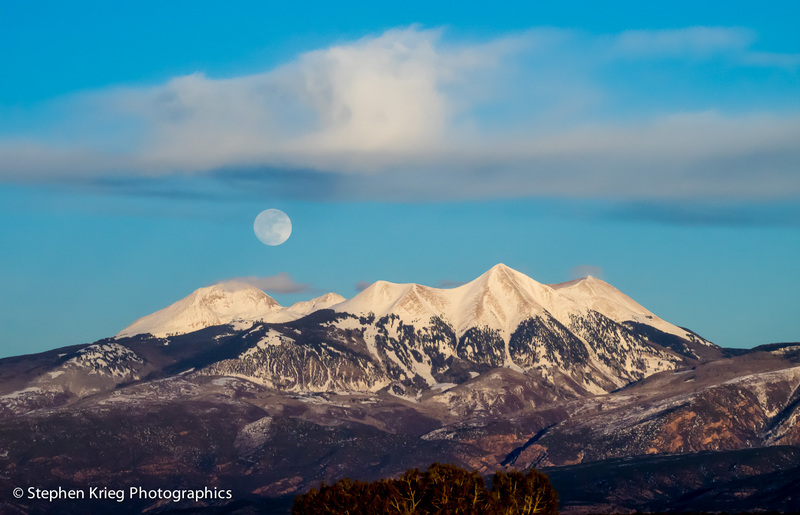 Part of my plan for this trip had been to be in place for a shot of the rising Full Moon over the La Sal Mountains to the east. I was in place, all right. I knew from the weather forecast that I was probably going to get shut out by the incoming storm. Sometimes you get lucky. Alpenglow on the flanks of the La Sal Mountains. At sunset the clouds lifted just enough from the valley for the just-set sun to reflect on the lower slopes of the La Sals as alpenglow. No moonrise? No problem! It had been such a spectacular day. Photo location: Canyon Rims Recreation Area, San Juan County, Utah. La Sal Mountains, from Old La Sal, Utah. It’s still early spring in the high country. It had been dry and warm, melting the snowpack. Too early. I had been wishing it would slow down. I was camped in southwest Colorado. Warm for mid April, nice. During the night the cold front came in, hard. In the morning I had to change out of shorts and sandals. Back to long pants and hiking boots for a little while. 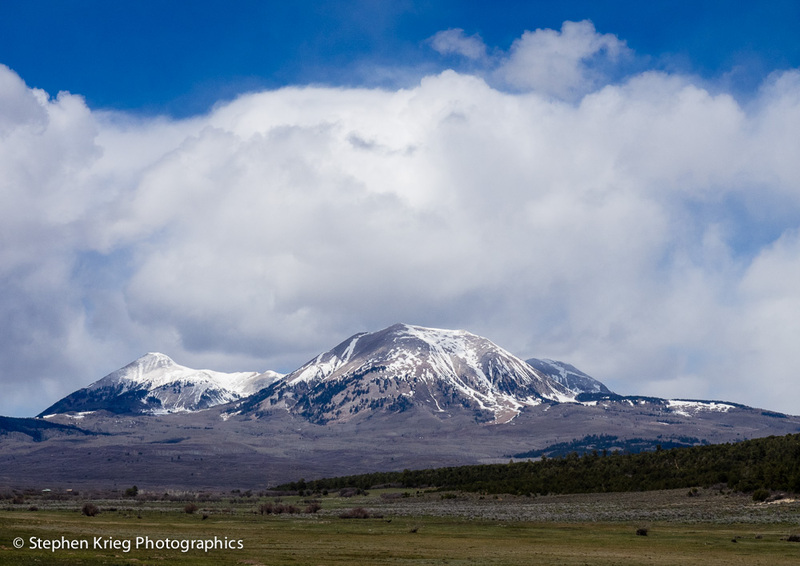 Coming back over into southeast Utah, the La Sal Mountains looked great in the crisp, clear air. Summer will be here soon enough, no need to rush things. February 2nd, the evening before Full Moon. Usually the best time of the month for moonrise landscape shots. The weather forecast was quite favorable: mostly clear, and calm. The setting perfect: southeast Utah, south of Moab, within view of the La Sal mountain range, cloaked with winter snow only a few days old. All is well, very well. Up it came. Of the several images I made of the scene, this is probably my favorite. Besides the peaks and the moon, the clouds floating above make for an even more interesting composition.